I am always happy to host play dates. The kids play with other children their age, they develop their social skills and don’t come each 5 minutes telling you: I am Bored! That’s why I love play dates: Children are kept busy! Part of the play date deal is: snacks! You can find great ready to go snacks in the grocery store. Since I host play dates on a regular basis, it can be really expensive and unhealthy. So I am always browsing the web for affordable and healthy snack ideas for the play dates. 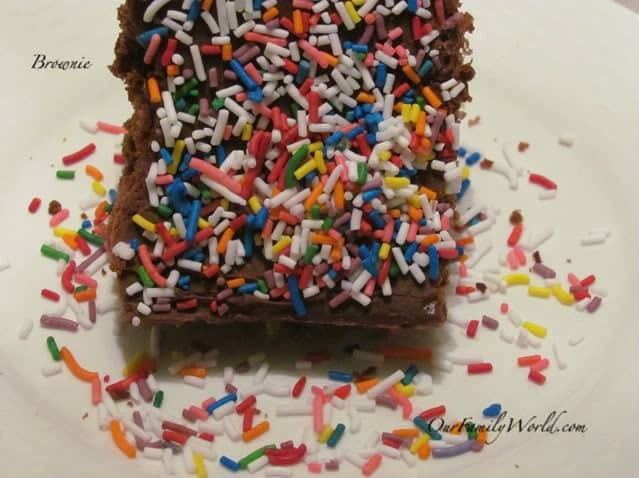 For this week’s play date, I found this excellent recipe Little Black Dress Brownie from How Was Your Day. The blogger calls it: Pantry Recipe, as almost everyone has these ingredients on hand at all times. This is so so true. I enjoyed making this recipe: Fast and not messy. You can make it with the help of your children. My 4 year-old had fun decorating it. ½ cup Walnuts or Pecans, chopped (It is optional. I decided not to go with it for when one of the children has allergies to nuts). Your favorite icing and toppings. Heat the oven on 325 F.
Grease an 8*8 pan. I used margarine but you can replace it with a cooking spray. In a large mixing bowl, mix the sugar and the melted butter. Stir in the melted chocolate. If you use chocolate square, microwave them for 2 minutes and then add them. Add the salt, baking powder and vanilla. Mix with a spatula. It is very easy to mix. Stir in the flour. 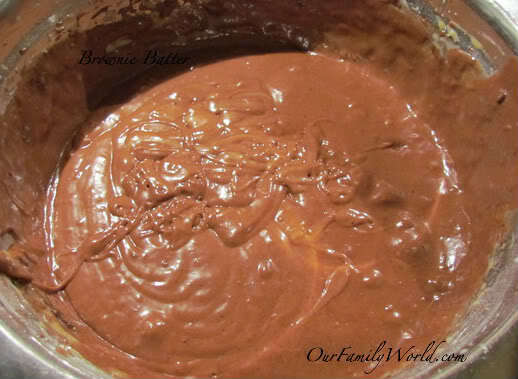 Here what the batter looks like! Yummy. Keep the children away from it!! 8- That’s it: Pour into your greased pan and cook for 20 to 25 minutes or until your toothpick comes out dry! 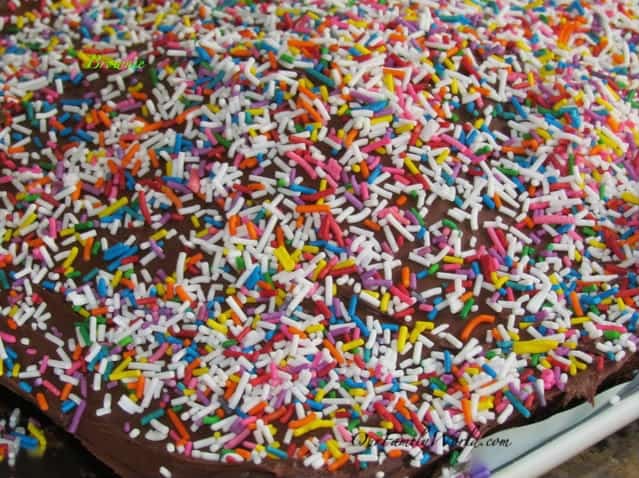 Here what the Fudge Cake brownie looks like! Some days, I don’t feel like decorating it so I serve it like this. It is delicious with a cup of milk. But for this week’s play date, I frosted it with a chocolate icing and colored chocolate. 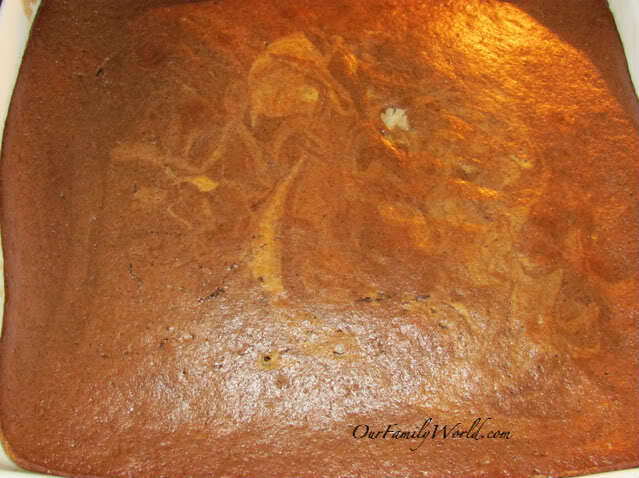 You need to let your brownie cool before you start icing it! This recipe yield in 12 to 16 portions. You can store for few days in the fridge if you don’t eat it immediately! Thank you How Was Your Day for this delicious and simple recipe! Yum! I love brownies. And love making them from scratch. I always use the recipe from Dorie Greenspan’s Baking from My Home to Yours but I’ll have to try this one. I am going to check this recipe! I am always looking for new ones. Thanks Danielle. This is not helping me diet. But I would so try this. You can replace sugar with a sweetener! It may help a bit!